Forever Manchester’s Annual Birthday Bash will be held at The Palace Hotel on Friday 5th February 2016. Our 25th Birthday was a great evening, with brilliant entertainment and an even better atmosphere, and next year’s is set to be even bigger and better! We are also pleased to announce that the event will once again be sponsored by Corporate Partners Metronet UK. 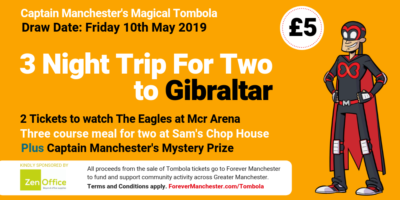 Held at Manchester’s prestigious Palace Hotel, guests will once again be treated to a three-course meal, entertainment from community groups Forever Manchester has funded, an awards ceremony and a special guest DJ. All profits from ticket sales will be reinvested in communities across Greater Manchester. If you wish to purchase tickets please use the EventBrite box provided below. Sponsoring Forever Manchester’s Annual Birthday Bash is a great way to support Forever Manchester while gaining fantastic brand awareness and exposure for your company. WHY SPONSOR FOREVER MANCHESTER’S ANNUAL BIRTHDAY BASH?